If you experience any problems with 3D models or you have any other questions, please look through the FAQs below and see whether the answers can help you with your problem. You can also help us assist you more efficiently - please give as much information about your problem as possible. 1. Why should I buy from your site? 2. Do you provide money-back guarantee? 3. Can I pay for your service with my credit card? 4. How soon can I receive the model I've bought? 5. I've purchased a 3D model, but it doesn't appear in my Orders. What should I do? 6. I need to convert the model to a different format. What should I do? 7. I need a custom model. 8. I have a problem with downloading my model. 9. Which 3D formats do you supply? 10. Do you offer any discounts (bonuses)? 11. Can I change colors of 3D models? 12. Can I modify the original car 3D models? 13. Do you offer free 3D models? 14. Do I get an invoice for my purchase? 15. What should I do if the purchased 3D model files were lost? 1.Why should I buy from your site? We are the developers of all 3D models presented on the site. We offer you only a high quality content and at lower prices. We also provide first-class support for our customers. 2.Do you provide money-back guarantee? Yes, we do. We provide money-back guarantee if a purchased 3D model has some errors and we cannot correct these errors or help with them. But for additional options we don't make refund. Because it is custom order and immediately after payment we start working on this. 3.Can I pay for your service with my credit card? Our payment system supports credit cards. You can pay with Visa, MasterCard, Discover, American Express etc. 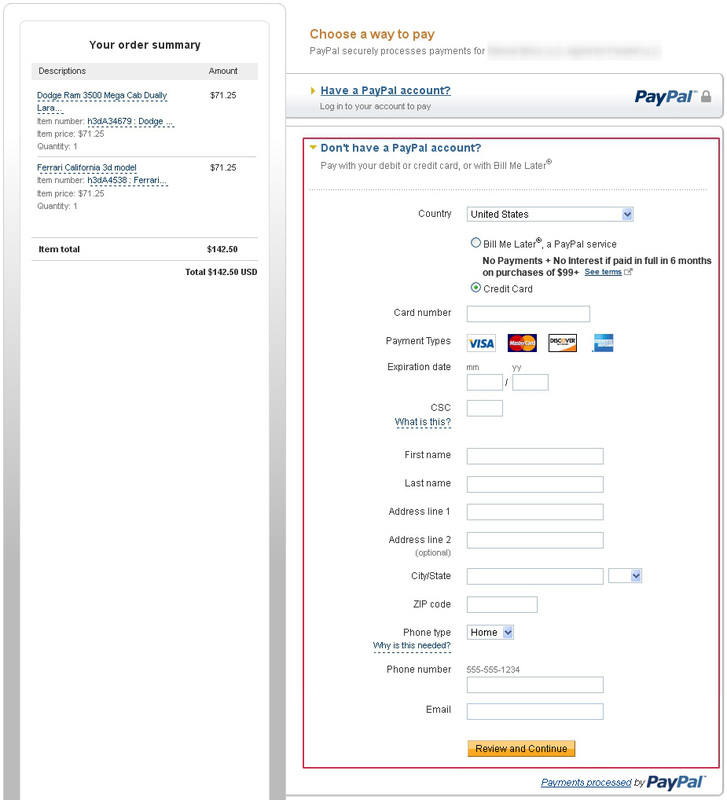 You just need to set up this method of payment at PayPal site. You will find an example here. 4.How soon can I receive the model I've bought? You will receive a letter with an exclusive link to the product with a payment receipt. If for whatever reason you don't receive your product, please check your junk folder and email adress, if you still don't have your product, contact Hum3D. *Please pay your attention that we don't provide any physical models. Hum3D deals only with computer files. 5.I've purchased a 3D model, but it doesn't appear in my Orders. What should I do? Sometimes email may go to junk/spam folder, please check these folders and if you don't find our email immediately reach us through the contact form or write a letter on our e-mail (info@hum3d.com) and we will help you right away. 6.I need to convert the model to a different format. What should I do? Please let us know through the contact form or e-mail (info@hum3d.com) and we will convert your model to any requested popular format for free. We can convert models to all these formats: 3Ds Max (*.max, all versions), Maya Binary (*.mb, all versions), Maya ACSII (*.ma), Cinema 4D (*.c4d, all versions), Lightwave 3D (*.lwo, all versions), Audtodesk FBX (*.fbx), Wavefront OBJ (*.obj), 3D Studio (*.3ds), AutoCAD (*.dxf, *.dwg), Rhinoceros 3D (*.3dm), Sketchup (*.skp), Stereolithography (*.stl), Element 3D AfterEffects CS3-CS6 (.aep), and others. We can also convert models to solid format IGES, but this is a paid service. The price is $50 and it will take a couple of business days. 7.I need a custom model. Please fill in the custom 3D order form. 8.I have a problem with downloading my model. If you have any problems with downloading, reach us immediately through the contact form or e-mail (info@hum3d.com) and we will help you right away. 9.Which 3D formats do you supply? Generally our models have these formats: 3DS (multiformat), Max 2008, Max 2008 V-ray, OBJ (multiformat), FBX (multiformat), LightWave 6.0, Maya 8.5, Cinema 4D. 10.Do you offer any discounts (bonuses)? We do provide discounts for those our customers who order more than one 3D model at a time. Discounts are available automatically and don't need to be applied for. You will receive a letter notifying you that you have bonuses. For more discounts don't forget to check the deal of the day. Please send your order to our e-mail (info@hum3d.com) or through the contact form giving a list of models you'd like to buy. We will answer you at the nearest time. (*The discounts don't sum up. We draw your attention that Hum3D reserves the right to change the discounts amount at anytime). 11.Can I change colors of 3D models? You can easily change colors by adding/modifying materials and textures of your models. To order the chosen 3D model in another color, please contact us and we will get back to you as soon as possible. 12.Can I modify the original car 3D models? You are free to change the initial look of any 3D model as you think best. You can edit anything you want from adding new elements to removing standard parts. If you experience difficulties with separating standard parts we will do it for you for free. For more information please contact us. We will assist you and comply with any of your requests. 13.Do you offer free 3D models? At the present moment Hum3D doesn't offer free 3D models, but we offer you 3D models at the lowest prices possible. We go on improving our facilities and introducing new offers; and there is a great likelihood that we can offer you free 3D models in the future. The information about this opportunity will appear on the main page. Don't forget to check the deal of the day. Here you will find a collection of our 3D models. 14.Do I get an invoice for my purchase? We provide invoices on request. You can order it in your profile. 15.What should I do if the purchased 3D model files were lost? When you loose the purchased 3D model file or it's corrupted you can easily download the model again. The file can be downloaded from the link you have approximately fifty times; and you don't have to pay extra money. If you experience problems with subsequent downloads, please contact us. Your request has been sent. We will contact you very soon! Do you need purchase invoice? Please go to the INVOICE page to get you purchase invoice. When will be available for download the requested format? We usually prepare additional formats within one business day. You will get an email when the requested format is added to the download area.